Since inventing storage virtualization nearly two decades ago, Avid has consistently led storage innovation tailored for the media industry. Avid NEXIS, their current shared storage platform, has immediately set a new standard, as it was the world’s first software-defined storage platform for media. ‘Software-defined’ means that your storage can be managed independently from the underlying hardware. This makes for easy maintenance as workspace size, bandwidth and access privileges can be set from a simple, easy-to-use web interface. More importantly, it also means that you can improve performance and add new features as you go, simply by applying a software update. A few months ago, Avid has introduced support for single-disk mirrored workspace protection. This option increases the usable storage capacity while at the same time protecting against the complete loss of an Avid NEXIS | Enterprise engine or any three simultaneous disk failures. So, you effectively get more storage, and additional protection options, all with just a software update. But the pace of technology marches relentlessly on, and from time to time Avid needs to add some extra hardware grunt, too. To accommodate high-resolution (4K/UHD and above) finishing, they’ve added the option of SSD drives to the Avid NEXIS | E2 engines. Available as either 9.6 TB or 19.2 TB Media Packs, you can edit bandwidth-intensive media in real-time with up to 8x greater read performance over hard disk drives. There are no moving parts, so it adds greater robustness to your workflow. And since Avid NEXIS is a scalable storage platform, this is a simple, additive process. All Avid NEXIS | Enterprise storage engines are fully compatible with one another. 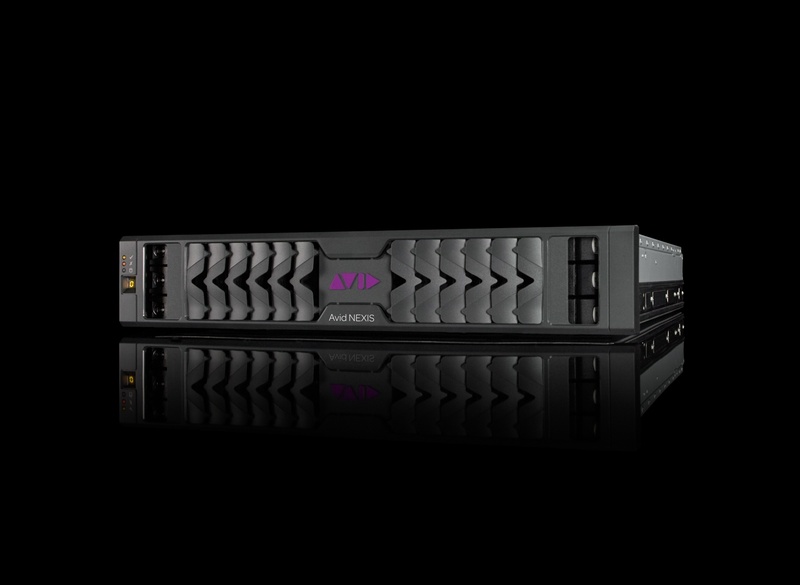 They can be mixed, matched and augmented, so a storage investment in Avid NEXIS never becomes obsolete as capacity, bandwidth performance and availability can be upgraded to meet changing content and production demands. As Avid is committed to improving collaboration across the broadest range of media workflows, they extensively test not just their own creative software tools like Avid Media Composer and Pro Tools, but also those from third parties, including Adobe Premiere Pro, Apple Final Cut Pro and Grass Valley EDIUS. At IBC 2017 last year, Avid excitedly announced MediaCentral for Post – a solution comprising Avid NEXIS, Media Composer and a component of the all-new MediaCentral eco-system, MediaCentral | Editorial Management, a robust, yet lightweight file management application. It’s a snap to install and configure, so you’ll be up and running in no time. Its MediaCentral Core indexing engine and service keep track of all projects and media stored, so everyone on the team can view what’s available in real-time. For post production in particular, we truly believe that this will be a real game-changer in terms of collaborative content creation, whatever resolution you are working in. With over 1,500 installations in just a year since its first release, Avid NEXIS is being adopted quickly by media producers all around the world—from preeminent global broadcasters to boutique post houses, and everything in between. Avid NEXIS is proven and trusted in the most demanding and bandwidth-intensive workflows. It continues to lead the market as reliable, high-performance, intelligent storage for media that can scale and adjust quickly to change, without interrupting production. Avid is taking productivity to new levels, not just by tweaking the tech, but also by turbocharging the capacity for teamwork. Would you like to schedule a demo of the Avid NEXIS? Fill out our online form and someone from HB Communications will be in touch.